Remember when getting two dollars from the Tooth Fairy was the most exciting event in your life (besides your teeth falling out of your face, which was pretty exciting, too)? Well, one of the Tooth Fairy’s customers is not so pleased, nor is she excited. Apparently, someone forgot all about Jennifer, so she wrote a very fierce letter in response to TF’s crappy customer service. With conviction and vigor, Jennifer wrote, “If you’re not going to come, then I’m going to keep my own teeth.” You tell that cheapskate what’s what, girl. In the letter, she adds “unsincerely” as a sign off, and this is a glorious cherry on top, as well as both of her P.S.’s, in which she states that she knows her brother has been getting money, and that TF should just not bother to write back. My two questions are: 1. Why is the Tooth Fairy forgetting about poor, salty Jennifer? and 2. Why is she getting neglected while her brother reaps the benefits of his lost baby teeth? A part of me feels very defensive on Jennifer's behalf, even though this letter was written years ago. 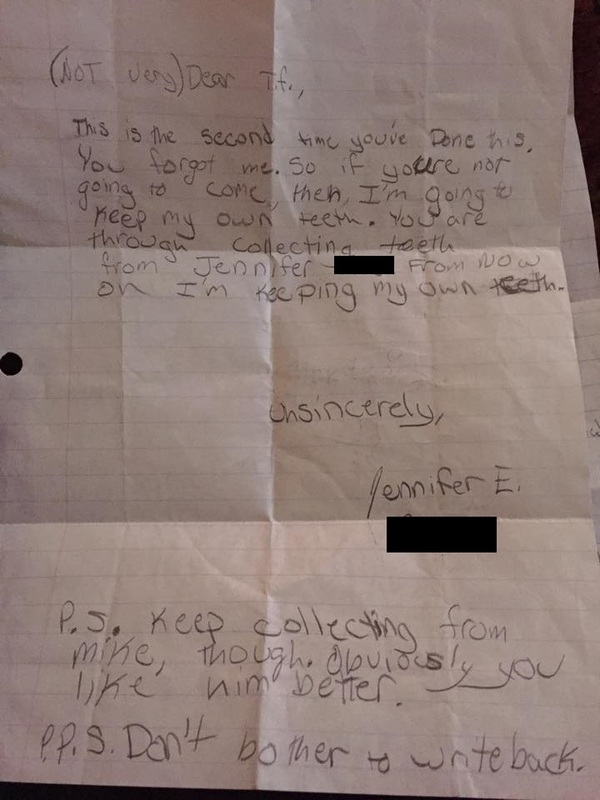 I hope Jennifer found out what the Tooth Fairy had against her. And while we’re on the subject: Who even thought of this Tooth Fairy business in the first place? It’s super creepy when you think about it: exchanging parts of your body for a couple bucks. What is the Tooth Fairy even doing with all those tiny little teeth? Is she going all Gillian Flynn and creating dollhouses out of them? Does she (or he; fairies come in all genders, right?) subsist on a diet of children’s teeth? Is that it?